As blood exits the left ventricle, it passes progressively through the aorta, arteries, arterioles, capillaries, venules, veins, and vena cava before returning to the right atrium. These vascular segments have significant functional differences. An extensive network of arteries and arterioles branch off of the aorta and distribute the cardiac output throughout the body. Arteries, particularly the aorta, have an extensive elastic tissue layer. This elastic tissue stretches during ventricular ejection.When the aortic valve closes and ventricular ejection stops, recoil of the elastic tissue slows the fall of arterial pressure during the interval until the next period of ventricular ejection. Blood vessels become stiffer with age and with atherosclerosis, contributing to the rise in systolic arterial blood pressure usually seen in older adults. Arterioles contain a high proportion of vascular smooth muscle. Arteriolar diameter is a major component of total peripheral resistance, and the contraction of vascular smooth muscle decreases vascular diameter and increases vascular resistance. The degree of contraction of vascular smooth muscle is determined by background activity of the autonomic nervous system, primarily the sympathetic nerves. In addition, circulating hormones such as epinephrine, norepinephrine, and angiotensin can also contract smooth muscle. The microcirculation consists of the small arterioles, the capillary beds, and the small venules. The smooth muscle of the small arterioles is contracted by sympathetic nerves. The precapillary sphincters (the last band of smooth muscle before the capillaries) respond primarily to local factors. Blood passes from arterioles into capillaries (5 to 10 |am in diameter).The capillary diameter approaches that of the red blood cell (7 p,m). Capillaries are the major site of exchange of nutrients and wastes between the blood and the tissues. Capillaries have only a tunica intima and the narrow wall facilitates exchange by diffusion. In tissues such as the skin, blood can also pass from arterioles to venules through metarterioles. Metarterioles are not exchange vessels but serve a separate role. Blood flowing through metarterioles can bypass the true capillaries. This allows a high volume of blood to flow through the skin. Increased blood flow through cutaneous metarterioles helps the body eliminate excess heat, and decreased flow enhances heat conservation. Venules (10 to 100 pm in diameter) collect blood from the capillaries in a convergent flow pattern. Venule smooth muscle is innervated by sympathetic nerves. Along with the veins, venules serve as capacitance (volume storage) vessels, containing two thirds of the circulating blood volume. Permeability of the postcapillary venules is controlled by hormones such as histamine and bradykinin. Postcapillary venules are also the site for the initiation of angiogenesis. Veins are the capacitance vessels of the circulation. Sympathetic nerve activity constricts the smooth muscle of the veins. This constriction does not impart a physiologically significant resistance to flow, but it does reduce the capacitance of the veins. The consequence of venoconstriction is that the blood storage capacity is diminished and blood flows more easily toward the right atrium. Because of the low venous pressure, venous blood flow is subject to gravitational influences. Valves in the larger veins ensure that blood flow is always toward the heart. Damage to venous valves can cause swellings, such as varicose veins, and lack of leg muscle movement can lead to venous stasis and clotting. During exercise, venous blood flow is assisted by the drop in intrathoracic pressure during deep inspiration and by extravascular compression of veins in the exercising skeletal muscle. Lymphatics are a network of endothelial tubes that merge to form two large systems that enter the veins. Lymph from the right side of the head, right trunk, and right arm drains into the right lymphatic duct. Lymph from the remainder of the body drains into the thoracic duct, which empties into the thoracic vena cava. Terminal lymphatics lack tight junctions, allowing large proteins (and metastasizing cancer cells) to enter the circulatory system through the lymphatic system. Lymph composition closely resembles interstitial fluid composition. In the GI tract, lymphatics allow digested fats to enter the circulation. Lymph is propelled by (1) massaging from adjacent muscle, (2) tissue pressure, and (3) contraction of the lymph vessels. Valves ensure that the flow of lymph is toward the vena cava. Over 24 hours, the volume of lymph flow in the body is equal to approximately 5 L, the same as the total blood volume. Lymph is filtered in lymph nodes before progressing back to the circulation. Hemodynamics describes the physical behavior of blood as a fluid. Hemodynamics examines the interrelationships between flow, pressure gradients, resistance, vessel cross-sectional area, and velocity. These relationships determine arterial pressure, cardiac output, and tissue blood flow, as well as explaining the appearance of murmurs and bruits. or, flow = pressure gradient/resistance, or for the peripheral circulation, cardiac output = (mean arterial pressure – right atrial pressure)/total peripheral resistance. or, velocity of blood flow = blood flow/cross-sectional area. Regions with a local narrowing of the blood vessel, such as caused by atherosclerotic plaques, have a high velocity of flow. High-velocity blood flow can generate turbulence, which increases the chance of clot formation. High velocity can also create shear on the vessel wall, and damage to the endothelium contributes to the development of aortic aneurysms. Lateral pressure, which provides the pressure for vessels that branch from the aorta at right angles, drops when velocity increases. For example, perfusion pressure decreases when an artery branches near the site of a stenosis. In addition, perfusion pressure is decreased in vessels arising from the root of the aorta because of the high velocity of blood flow in this area during ventricular ejection. assumptions are not met, the equation provides a useful description of the regulation of blood flow. For example, a small change in radius has a marked effect on blood flow, reflecting the fact that flow is proportionate to (radius)4.
. Blood flowing through vessels in series has to pass through each vessel in the series, so increasing resistance to blood flow in any one vessel in the series will increase the total resistance to blood flow.
. In this arrangement, blood has a number of routes to exit the aorta. Opening a new exit route will make it easier for blood to exit the aorta, so adding a new resistance actually decreases the total resistance of the system. Flow in the vascular system can be organized in laminar or turbulent patterns. Laminar (streamline) flow moves in concentric circles, fastest at the center of tube. Turbulent flow is disorganized and requires more energy to travel the same distance as laminar flow. The chance of turbulent flow increases with increased velocity; e.g., atherosclerotic plaques narrow the blood vessels and can cause turbulence. Decreased blood density, such as caused by anemia, can also cause turbulence. Turbulent flow is audible as a murmur in the heart or bruit in the peripheral circulation. Viscosity is a measure of the tendency of a fluid to resist displacement. It is due primarily to red blood cells, so blood viscosity is proportionate to hematocrit. Viscous drag increases as velocity increases, so high velocity of blood flow in the aorta can tear the endothelial surface and cause a dissecting aneurysm. In capillaries, the apparent viscosity is lower than otherwise predicted owing to the red blood cells flowing close to the center of the vessel and to plasma flowing adjacent to the endothelial cells. Pressure-volume curves reflect the compliance, or distensi- bility, of vessels.Arteries have low compliance. Consequently, small volume changes cause marked pressure changes. Veins have high compliance. Consequently, even large volume changes cause only small changes in pressure. In cardiovascular control, contraction of arterial smooth muscle will affect primarily pressure, whereas contracting venous smooth muscle will affect primarily volume. Vascular compliance characteristics decrease with age owing to “hardening of the arteries,” or atherosclerosis. or, transmural tension equals pressure times radius. Capillaries have a very small radius and do not rupture when containing blood at 20 mm Hg pressure because of the low transmural tension directed against their walls. In contrast, the increase in diameter in dilated hearts results in an even greater transmural tension on the ventricular wall than would be predicted from the ventricular pressure alone. Blood in the arteries exhibits a cyclic change in pressure. Arterial pressure is a function of the volume of blood entering the arteries (both stroke volume and heart rate), the volume exiting the arteries (determined by peripheral resistance), and the compliance of the arterial vessels. Arterial pressure is reported as systolic pressure, diastolic pressure, mean arterial pressure, and arterial pulse pressure. 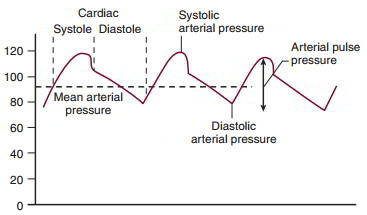 Systolic arterial pressure is the highest pressure recorded in the arteries during the cardiac cycle. It occurs during ventricular systole and is determined in part by ventricular stroke volume. Diastolic pressure is the lowest pressure recorded in the arteries during a cardiac cycle. It occurs just before the opening of the aortic valve and is determined in part by heart rate and by the rate of blood flow out of the arteries, a function of peripheral resistance. Pulse pressure is the difference between the peak systolic and the diastolic pressure. The arterial pulse pressure is altered by stroke volume, which preferentially affects systolic pressure; by heart rate and peripheral resistance, which preferentially affect diastolic pressure; and by a decrease in compliance, which increases systolic and decreases diastolic pressures. Arterial blood pressure can be measured directly or estimated indirectly. Direct measurement is invasive and costly. A fluid-filled catheter is introduced into the blood vessel and connected to a pressure transducer and recording device. Alternatively, a small pressure transducer can be inserted directly into the blood vessel, eliminating the need for a catheter. This approach requires careful calibration of the transducer and is subject to possible error due to catheter orientation. occluded for only a portion of the arterial pressure pulse. Turbulence is generated when blood from the heart side of the cuff impacts the stationary blood downstream of the cuff. This results in an audible event and the reappearance of a pulse in the wrist. The cuff pressure at this time is the estimation of systolic arterial pressure. As the cuff pressure is slowly lowered, the brachial artery is occluded for only a portion of the time. The Korotkoff sounds crescendo and become muffled. When the cuff pressure is lower than the diastolic pressure, the brachial artery remains open for the entire arterial pressure pulse, and no sound in generated. The cuff pressure at the time of the last sound is an estimation of diastolic arterial pressure. Normal arterial blood pressure measurement reports both systolic pressure and diastolic pressure. Delivery of nutrients to the tissues and removal of waste products from the tissues require both blood flow and exchange between the tissue and the blood. Blood flow in the microcirculation is largely determined by local control but also is influenced by neural and humoral components. Transcapillary exchange of nutrients and wastes is a function of the substance’s chemical structure and is governed by the processes of diffusion, filtration, and pinocytosis. where J = net flux of a compound, or diffusional movement; – = movement down the concentration gradient; D = diffusion coefficient, a function of the compound and the barrier; A = surface area available for exchange; Ac = concentration gradient; and Ax = distance. This equation illustrates that diffusion movement is directly proportionate to surface area and the concentration gradient and that diffusion movement is inversely proportionate to distance. Diffusion is influenced by permeability across the barrier, and for transcapillary exchange, movement is influenced by solubility in lipid cell membrane or water. where k = permeability coefficient; Pc = hydrostatic (blood) pressure in the capillary; n, = oncotic pressure in the interstitial fluid; P, = hydrostatic pressure in the interstitial fluid; and nc = oncotic pressure in the capillary from plasma proteins. Filtration occurs at the arteriolar end of the capillaries, and reabsorption at the venular end of the capillaries. 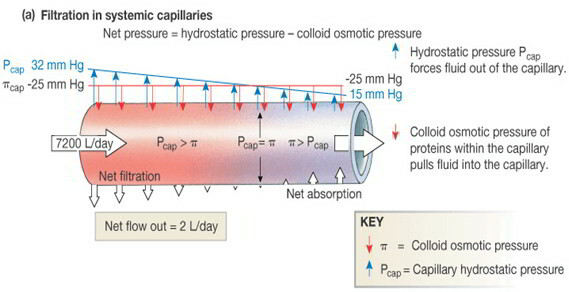 The balance of hydrostatic and colloid osmotic pressures favors filtration at the arteriolar end of the capillaries. The drop in pressure along the length of the capillary reverses this balance, and absorption occurs at the venous end of the capillaries. Any change in hydrostatic pressure or colloid osmotic pressure can change the fluid balance between the capillaries in the tissues. Pinocytosis through cells represents a pathway for the exit for high-molecular-weight proteins, such as albumin. Pinocytosis does not significantly contribute to the reabsorption of proteins owing to the relatively small protein concentration in the interstitial fluid. Fluid pressure in the interstitial spaces is usually negative (as low as -6 mm Hg). Interstitial fluid is moved back to the plasma by reabsorption in the capillaries and by transport within lymph vessels. Lymph flow increases as the accumulation of fluid in the interstitial spaces increases interstitial fluid pressure. Maximum lymph flow can be limited because the interstitial fluid pressure acts to compresses the lymphatic vessels. At this point, any further increase in interstitial fluid pressure also results in compression of the lymph vessels. Lymph flow is increased by a number of factors: increase in capillary pressure, increase in capillary surface area, increase in capillary permeability, decrease in plasma colloid osmotic pressure, and increase in interstitial fluid protein concentration. As predicted by the Starling hypothesis, all these changes also increase net capillary filtration and increase fluid transfer into the interstitial space. Lymph flow assists in the removal of this excess fluid and prevents excess fluid accumulation. Edema is an excessive accumulation of fluid in the tissue spaces resulting from an imbalance in microcirculatory fluid exchange. Multiple possible mechanisms can result in edema. Heart failure (congestive heart failure) elevates capillary pressure. Obstruction of the veins increases capillary pressure. Protein wasting syndrome decreases plasma oncotic pressure. Inflammation increases capillary permeability, affecting both the permeability coefficient and the plasma colloid osmotic pressures. Malnutrition and toxic substances decrease albumin synthesis, thereby lowering plasma oncotic pressure. All these events can lead to formation of edema. Edema usually does not occur because interstitial fluid pressure is very low. Lymph flow increases as interstitial pressure increases, which drains the interstitial spaces. Increased lymph flow also causes a washout of protein in the interstitial space, decreasing interstitial fluid colloid osmotic pressure. In contrast, chronic lymphatic obstruction traps albumin in the interstitial spaces and increases interstitial fluid oncotic pressure and interstitial fluid volume, leading to edema. In most tissues, blood flow is tightly coupled to metabolic need. Accumulation of metabolites relaxes vascular smooth muscle, with the subsequent increase in blood flow assisting in the removal of the excess metabolites. Notable agents that couple metabolism and vasodilation are adenosine, especially for the heart, and H+, especially for the brain. Depletion of nutrients such as O2 also relaxes vascular smooth muscle. The vasodilation is limited to the area producing the excess metabolites. As the elevated blood flow washes out vasodilators, vascular resistance returns to normal. The metabolic regulation of blood flow accounts for observations of active hyperemia, reactive hyperemia, and in part, autoregulation. Active hyperemia is the increase in blood flow in metabolically active tissue. Reactive hyperemia is the increase in blood flow observed following release of an occlusion. Interruption of blood flow to tissue results in depletion of nutrients and buildup of metabolites. These events cause dilation of the vasculature. After blood flow is restored, there is a period of enhanced blood flow (reactive hyperemia), which helps wash out the accumulated metabolites. In both active and reactive hyperemia, blood flow is inadequate to match tissue metabolic needs, and the accumulating metabolites cause local vasodilation. Once the metabolites have been washed out, the vasodilatory stimulus is no longer present, and the vascular resistance returns to control levels. Angiogenesis provides a long-term matching of blood flow with metabolic needs. Capillary density is proportionate to tissue metabolic activity. Tissue hypertrophy and hyperplasia are accompanied by new vessel growth. Angiogenesis inhibitors are used to restrict blood vessel growth in highly metabolic tumors. Autoregulation is prominent in the cerebral, coronary, and renal circulations. For these tissues, blood flow remains constant over a wide range of blood pressure Three hypotheses are advanced to account for autoregulation. The metabolic supposition ties blood flow to metabolic needs, so that excess blood flow removes the vasodilator metabolites. The tissue pressure hypothesis proposes that high blood flow increases filtration into interstitial space, causing extravascular compression of the vessels to increase vascular resistance. The myogenic premise states that vascular smooth muscle contracts as a result of high wall tension, as described by Laplace’s law. Evidence for the above hypotheses is present in at least one type of tissue. To be effective, local metabolic control of blood flow requires sufficiently high arterial pressure. Arterial blood pressure is regulated by numerous redundant neural and humoral control systems. The arterial baroreceptor reflex is a negative-feedback mechanism that helps maintain arterial blood pressure. The arterial baroreceptors are stretch-sensitive nerve endings in the aortic arch and carotid sinus. As stretch receptors, a decrease in blood pressure reduces the rate of firing and an increase in blood pressure increases the rate of firing. Afferent nerves carry this information to the cardiovascular control centers of the medulla, where it is integrated. The SNS and PNS constitute the efferent component of the reflex. The SNS regulates arteriolar resistance, impacting the arterial pressure. The SNS also regulates cardiac contractility, while the PNS regulates heart rate. Finally, the SNS regulates venous capacitance by venoconstriction. A drop in arterial blood pressure leads to an increase in SNS activity and a decrease in PNS activity, both of which should act to help restore blood pressure to normal. In addition to arterial blood pressure, the circulating blood volume is regulated. Cardiopulmonary “volume” receptors pulmonary circulation. These volume receptors help regulate urinary volume excretion through both neural and hormonal systems. Vascular smooth muscle contraction is determined by the balance of intrinsic, humoral, and nervous system inputs. Basal vascular smooth muscle tone results from a constant background of autonomic nerve activity, and the degree of contraction is modulated by other factors. Vascular smooth muscle tone is partially self-determined by the stress-relaxation response. Most vascular smooth muscle tone is due to external factors such as the SNS and PNS (as described above) and humoral agents. Epinephrine exerts a biphasic cardiovascular effect. Epinephrine stimulates P2-adrenergic receptors, causing vasodilation. Epinephrine also stimulates a1-adrenergic receptors, causing vasoconstriction. P2-Adrenergic receptors are more sensitive than a1-adrenergic receptors, so vasodilation is seen at low epinephrine doses. a1-Adrenergic receptors are more numerous than P2-adrenergic receptors, so vasoconstriction is seen at high epinephrine doses. Angiotensin II is a powerful vasoconstrictor. Angiotensin II is formed by the sequential actions of renin and angiotensinconverting enzyme. Renin release is the rate-limiting step in angiotensin II formation. Renin is released from the kidney by numerous factors, including hypotension, renal sympathetic activity, and low plasma Na+. Humoral vasodilators include histamine, bradykinin, and serotonin. These agents generally act locally. However, in anaphylactic shock, a massive release of histamine from mast cells can cause severe hypotension. The SNS constricts the vascular smooth muscle of the arteries and the veins by activating a1-adrenergic receptors. Arteriolar vasoconstriction increases arterial pressure. The vasoconstriction decreases blood flow through vessel and consequently increases the volume of blood remaining in arteries. Venoconstriction decreases venous capacitance. This increases venous return and therefore cardiac output. The SNS is tonically active; this is called sympathetic vasomotor tone. A decrease in basal SNS activity decreases vasomotor tone and dilates the blood vessels. Sympathetic cholinergic nerves innervate sweat glands and can act indirectly to vasodilate by inducing bradykinin release from sweat glands. The PNS has a limited role in control of peripheral vasculature. Parasympathetic nerves innervate a limited number of vessels in viscera, the face, and pelvic organs but play an important role in sexual arousal. Acetylcholine causes release of EDRF (nitric oxide) from the vascular endothelial cells and therefore can vasodilate indirectly. SNS and PNS outflow is coordinated in the cardiovascular centers of the medulla. The dorsolateral medulla initiates responses that raise blood pressure, and the ventromedial medulla initiates responses that lower blood pressure. Medullary cardiovascular centers receive descending input from cerebral cortex, thalamus, hypothalamus, and diencephalon. A variety of afferent inputs impact cardiovascular control. Arterial baroreceptors regulate both sympathetic and parasympathetic activity. Cardiopulmonary volume receptors selectively control renal sympathetic nerves and also antidiuretic hormone release. Peripheral chemoreceptors of the aortic body and carotid body mediate effects of blood gas changes on the SNS. Central chemoreceptors respond to high CO2 with general sympathetic activation, as seen in the central nervous system (CNS) ischemic response and in Cushing’s reflex. The hypothalamus has some direct effects, notably body temperature-sensitive control of cutaneous circulation. Output from the cerebrum normally is pressor but occasionally is depressor, e.g., blushing and fainting. Pain fibers can elicit diverse cardiovascular responses: skin pain often is pressor and visceral pain often is depressor.